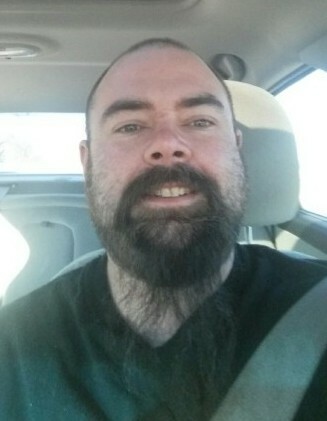 Eric J. Glinnon, age 41 of Sauk Centre, died unexpectedly April 13, 2019 surrounded by his family at the St. Cloud Hospital in St. Cloud, Minnesota. A Memorial Service will be held at 1 p.m. Thursday, April 18 at Patton-Schad Funeral Home in Sauk Centre. Visitation will be held from 12 to 1 p.m. Thursday at the Patton-Schad Funeral Home in Sauk Centre. Eric James Glinnon was born April 16, 1977 in Fort Smith, Arkansas to Patrick and Jo Alene (Gilbertson) Glinnon. I lived in Arizona, St. Cloud, and Sauk Centre. When I was seven years old, I got to hang out with Professor Jerry Mertens (Master of Magic and Santa Claus in St. Cloud). I was able to help him do his magic shows and was his elf and enjoyed plunking away on the typewriter. In 1995, I graduated from Apollo High School in St. Cloud. I was the owner of Glinnon Drywall. I was a master of many talents, from teaching myself to play guitar, fixing cars, racing stock cars, and fixing anything I wanted to fix. My family, friends, and fishing were my love. I lived my life to the fullest with zest and vigor. Maybe some of it was tough at times, but I always got through it. I have reached the final page in my book of life, where it is stamped “The End” – which means my mom is writing this and who knows what she has to say. You’re about to find out. (I got my humor from her). Eric, you left us all too soon and broken hearted we are. I brought you into this world 41 years ago as a beautiful, healthy, bouncy boy and it’s been a journey of love, laughter, and a few tears. Plus a handful of moments I wanted to string you up somewhere. I never thought I would be doing this today. Tomorrow is your 42nd birthday. I know 41 years is young, but it’s not about the years in your life, but rather the life you lived in those years. Dad and I always hoped we would be good parents. Today we know we got that right. You have a little of both of us in you. Your fierce temper from both of us and your humor, softness, and caring for other people is definitely from me (maybe a dab from your dad). According to your baby book I can share this evidence about you. You would always stand in front of the TV and watch every commercial. Your favorite music was the theme songs from the Brady Bunch and Happy Days. Your favorite show was Mickey Mouse. You would always sing “nobody can do it like Mickey Donald can.” We survived the tornado that hit Bel Clare Acres in Waite Park on September 3, 1980 and you said “look at all this junk-junk everywhere.” We love you baby to the moon and back. You will always be with us. We have celebrated your life and don’t want to mourn your death. You took the trip of a lifetime, destination: Heaven. Surrounded by all you knew and living with Jesus for eternity. We are at peace knowing that. Eric is survived by his significant other, Destiny Schoolfield of Sauk Centre; step-children, Korbin, Kaitlynn, Richard, Abel and Magi of Sauk Centre; parents, Pat and Jo Glinnon of Alexandria; sisters, Beverly (Gilbertson) Everts, Kristi, Kim, and Tiffany; brothers, David and Gary; and many aunts, uncles, nieces, nephews, and cousins. Eric was preceded in death by his grandparents, Cy and Alice (Gilbertson) Wald, James and Marion Gilbertson, Jerry Glinnon, and Helen Bahneman; and uncles, Jimmy Gilbertson, Mike Glinnon, and Chuck Finch; and cousin, Tim Finch.